It's been a very busy week going up the hospital twice a day to see Mum. She seemed quite a bit better again yesterday but healing 2 broken ribs and a punctured lung is going to take some time. Such a gorgeous image and your colours are fabulous! Glad that you mum is comfortable hope she heals quickly. Hi Brenda. 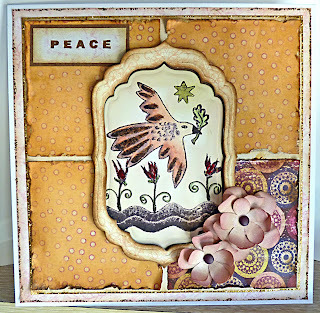 We so pleased to have you join us at Lets Get Stamping. Your cards are fabulous and I really can't wait to see more from you in the future so I hope you'll find time to drop by again. I really do love the distressing on this card. The image is beautiful and so right for this week's wings theme. Everything fits together beautifully in fact. Lovely job. I'm amazed those flowers are just photocopy paper.